But how will climate change affect our bees? The IPCC was established in 1988 by the United Nations and World Meteorological Organisation to bring clarity to the issue of climate change. The IPCC does not conduct any research nor does it monitor climate related data or parameters. Instead, thousands of scientists from all over the world contribute to the work of the IPCC on a voluntary and non-governmental basis. Based in Geneva, the IPCC aims to reflect a range of views and expertise and currently 195 countries are contributors. Climate change reports are released periodically and the latest – the IPCC Fifth Assessment Report was published in 2014. If you have read the Fifth Assessment Report – you’re a better man than I am, Gunga Din. It’s in the region of 30 chapters and 1500 pages! Shift in climatic zones may cause extinctions of some species and invasions by others. So how will this affect our bees? The warming of the earth’s oceans means that more water evaporates into the atmosphere. When the prevailing winds reach land the air rises and cools and the water in the air condenses forming clouds. So although the summers might be slightly warmer year on year, they will be cloudier and rainier. Wet weather makes it more difficult or impossible for bees to forage. They either don’t go out at all or when they do – everything is wet. Open faced flowers facing upwards such as dandelions and hawthorn fill with water – the pollen is soaked and the nectar is washed away. As we know, queen bees mate with drones on the wing in drone congregation areas. When weather is wet, neither drones nor queens will fly out to mate. Also, virgin queen bees mature 4-8 days after emergence. After this they have two weeks to mate successfully. That’s not to say that some sort of chitinaceous biological door slams shut making the physical act impossible. They can still mate for a time but it becomes less and less likely that they will mate well. Such queens can start to lay but they will probably fizzle out quite quickly – sound familiar? So long periods of wet weather add yet another obstacle to a successful outcome. Let’s not forget the functioning of that insect barn dance (drone congregation area) is already compromised by the ravages of Varroa on the wild populations of honey bees. Bees confined to hives for long periods of time means bees rubbing shoulders more, so diseases are more effectively distributed by Varroa and proximity. They are also effectively more congested and we all know what congestion does to bees don’t we? Yes, they’ll swarm. And of course we humans beeing know all about wet summers. Watching the Met Eireann Rainfall Radar for a gap in the clouds and trying to look after bees with the rain beating on your back. Countries in the north of Europe have experienced a rise in winter temperatures and there has been a reduction in the number of frosty days. This is not helpful either. Generally – the colder the winter – the better the bees come through it. In the very cold winters of 2010 and 2011 where heavy snow fell and stayed put for weeks and temperatures dropped to minus 18C my bees scarcely seemed to notice. Bees are well able to thermoregulate. They cluster tightly and activity is reduced to communal shivering which produces enough heat to sustain them. The bees in the cluster constantly churn – taking turns on the outside. In this low-activity state they use very little of their stores. In mild winters, bees can be quite active and may produce brood all the way through. This is not necessarily a good thing! When they do this – they are of course burning more stores – including pollen. If a mild winter is followed by a long cold spring they can be in trouble and in fact this is what happened in the winter of 2012/13. The wind went into the east in the spring and the weather turned very cold. The bees totally failed to work the willow – in fact the catkins here went black and fell off in the cold. Instead of building up on the willow pollen which is what usually happens – colonies dwindled to tiny clusters which then ‘starved in the midst of plenty’ in other words, they had lots of stored honey but the clusters were so small, the bees became isolated from them. Despite spring feeding pollen substitutes my winter losses that year were 50%. Fortunately the summer of 2013 was very good and I was able to build up to full strength again by the end of the year and get a decent amount of honey into the bargain. If instead the summer had been like 2012, like the ones forecast by climate change it would have been a different story. Mild winters can also mean more disease for example, chalkbrood which thrives in damp conditions. A good cold winter can make things like these grind to a halt. While I think of it, a good cold winter will also bring wax moth to a halt. In a mild winter when there is no gap in brood rearing Varroa will also be able to reproduce albeit at a low level. This can lead to a Varroa epidemic come spring if mid-winter treating is neglected. It is thought that natural breaks in brood production such as after a swarm or in midwinter help the bees control Varroa. Adult mites can survive for a time on adult bees but some fall off and some bees are able to detect and remove them. Mild winters also have implications for another mite – Tropilaelaps. This mite has not got to Ireland – yet – but if it did get here climate change could allow it to be another disaster. Tropilaelaps builds up much more quickly than Varroa and can decimate a honey bee colony in no time. The Achilles heel of this mite is that its mouth-parts are not strong enough to pierce the chitin exoskeleton of an adult bee which means they cannot overwinter in colonies that have a broodless period. Need I say more? Wasps are a bane at the end of summer when their robbing activities can destroy nucs and small colonies not to mention Apideas. This autumn has been unusually mild which has been good for the bees in one respect – the ivy flow has been tremendous. On the other hand – the wasps are going on and on, with many active nests to be seen along hedgebanks. They seem to have established a routine of robbing and the bees seem to be letting them away with it! After such a heavy ivy flow, the impact of this will probably be negligible but ivy flows cannot be relied upon and wasps could become a more serious pest and a real threat to wintering bees if climate change continues. And it will of course. More extreme weather events are predicted as part of climate change. In this part of the world that means the full spectrum of wind and rain from squalls to hurricanes. The summer of 2012 was atrocious. It soon settled into an endless series of squally showers interspersed with bursts of brilliant sunshine. Striped weather. The rest come home in a great crowd and can’t physically get in through the door and are dashed to the floor in a wet lump. Queens out on mating flights may not come home – dashed out of the sky. In the summer of 2012 it was almost impossible to get queens mated properly and they fizzled out midwinter. This contributed to the crushing losses that winter. Speaking of crushing losses – when hurricanes come in the winter, hives are all roped down so if trees or branches fall or if the wind blows them over, they will stay roped together till the beekeeper comes to the rescue. If they start to come outside winter then there could be more of this sort of stuff. Even if falling trees miss your hives, they can break fences then there are cattle. Or horses. If your bees are close to the sea, watercourses or set in hollows – best think again. All that rain will flood areas that never flooded before. 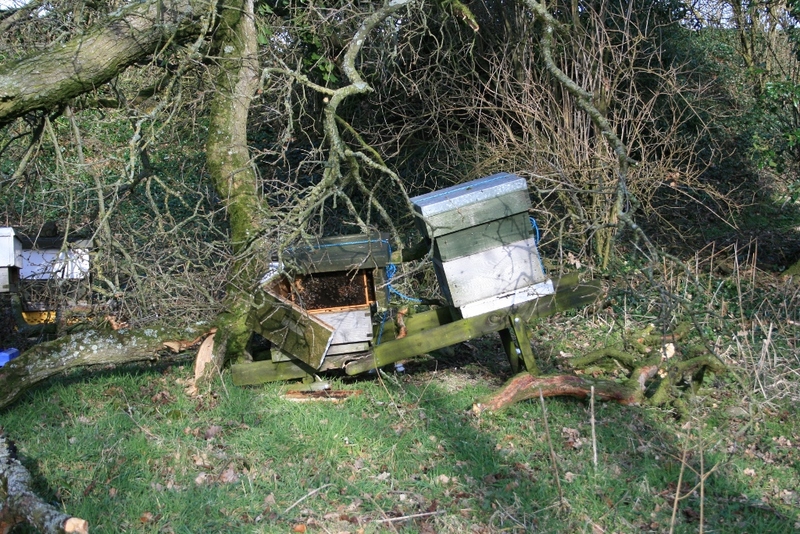 When choosing a new apiary site – the possibility of flooding should be seriously considered. Climatic zones are expected to shift with climate change. This could bring all sorts of pestilence and plague. Here in Ireland we are at the limits of the natural climatic range of the honey bee. We can see the problems that worsening weather can cause our bees. They won’t be extincted because we will be here – for a while anyway – to look after them. However, if the climate here becomes acceptable to invasive species be sure they will get here one way or another. In the not too distant future we could be looking at small hive beetle, Tropilaelaps mites, Giant Asian hornets Vespa mandarinia and woodpeckers. Giant hornets can take out entire colonies of honey bees. Green woodpeckers are a pest in the UK where they can peck right through a wintering hive. Bees and flowering plants evolved together within relatively settled climatic zones. Many flowering plants have become dependent on bees for pollination and vice versa; the flowering times are often synchronised with insect population dynamics to the benefit of both parties. Climate change could effectively maroon these relationships in a climatic zone which will not play ball. Plants may be triggered to come into bloom too early or too late meanwhile the bee populations may peak to take advantage of an expected floral fiesta that happened a month ago – in the rain. The mismatch possibilities are endless. Ivy is very important to honey bees in Ireland. They work it throughout the late summer/early autumn and build up quantities of winter stores. This year (2015) the ivy was late compared to the previous two years. In lowland apiaries, heavy ivy flows were recorded but up the hill a bit with slightly colder/wetter weather little ivy honey was was brought in. Last year (2014) the ivy came into bloom very early and the bees worked it like mad bringing in huge crops for the winter. Variation in flowering times is nothing new, but in league with the approach of winter and ever increasing rainfall, late flowering may come to mean no crop and no autumn build up. Sycamore and dandelion provide very important early flows for the bees. Squally weather when the sycamore is in bloom strips the flowers off the trees. Dandelions face upwards and get washed out. Willow is a very important early source of pollen and we know what happened to that in the spring of 2013. Keeping bees is fraught with difficulties – we all know them, there’s Varroa and there are other diseases, there are pesticides and habitat loss, queenlessness, drone layers, laying workers and in-breeding. We can just about cope with all of these things in the weather of an average year. To see just how influential the weather is, then we only need to remember the summer of 2012 (when weather was so vile it felt like a vendetta) and compare it with the lovely summer of 2014 (when the weather did what weather is supposed to do). Wall to wall queenlessness, drone layers, laying workers you name it, followed by 50% losses the following spring. 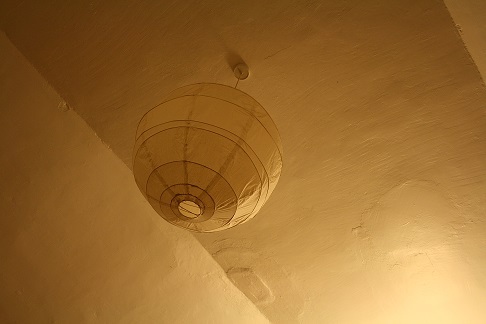 Most of the problems beekeepers face year on year simply ceased to be problems at all plus historic bumper honey crop.